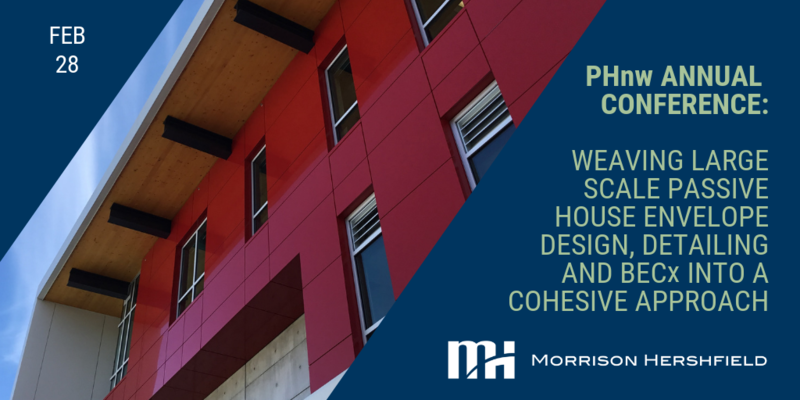 We’re excited to join the program with two presentations at this year’s Passive House Northwest (PHnw) annual conference! The 2019 conference theme is “10 Years of Building Beyond Zero” and will include a retrospective of the work PHnw has accomplished over the last decade, as well as sessions on policy and sustainable design approach, among others. The conference will take place on Thursday, February 28 and Friday, March 1 in Portland, Oregon. The uptake in large-scale Passive House (PH) projects has led to an increase in complexity concurrent with increased involvement of design and construction professionals for whom passive house is new. Traditional project teams are not typically well-equipped to fine tune the building envelope detailing with the rigor needed to ensure performance en par with passive house. In this panel discussion, we will review intersection details for various multifamily and commercial projects that can cause an issue with thermal bridging, air sealing and waterproofing. We’ll cover design workflow and plan review strategies with respect to high performance detailing. Together, we’ll explore how to use the BECx approach to avoid getting into trouble. We’ll wrap up with a summary of recommendations for streamlined design and commissioning of high performance enclosures from PH to beyond. This panel will be presented by three members of Morrison Hershfield’s Building Science team, including: Prudence Ferreira (Passive House Practice Lead), John Duncan (Senior Building Science Consultant), and Jamie McKay (Sustainability and Building Envelope Commissioning Specialist). In this talk, we’ll journey through an inspirational look at the global crises facing the world and a variety of ways to transform your business to adapt to a warmer, wetter world. Learn from our work with hundreds of municipalities, agencies, and companies to reduce their carbon, boost their performance, slash their operational expenses, and provide healthy spaces for everyone. Learn how to link design to outcome and uncover new ways to expand your business. This session will be presented by Sustainability Disruptor, Eric Corey Freed.